I will let you in on a little secret and it is a good one. I use a declutter calendar and it works wonders on my house. I found this website about two years ago. Every month I download the current month and start checking things off every day. 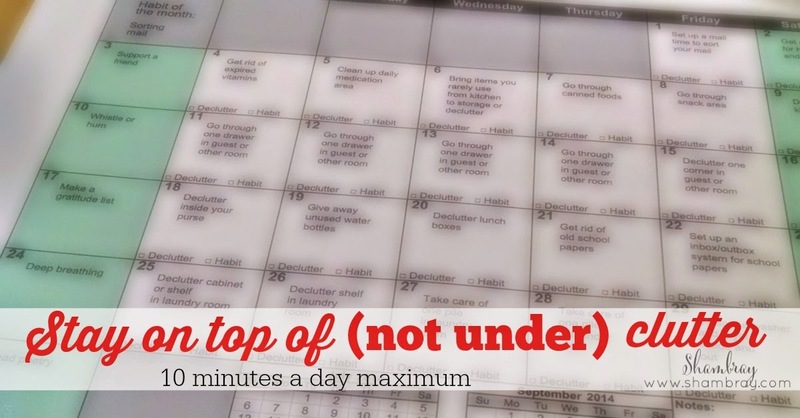 Honestly, many of the days I do not have to do anything because this calendar helps me stay on top of the clutter and the item or area is already decluttered. There are days that take more time than others, but generally I can take 5-10 minutes a day and get on top of the clutter. I set a reminder on my phone to help me to remember to check this calendar. If I do not do this then I easily forget because of the million other things I have going on every day. So go to the website, sign up to get the calendar (you won't get a ton of emails if you sign up...they are VERY few), then download the current month's calendar. Then get to it (if you have to set a timer like me, then do it). The key is to do it everyday and you will feel a weight that you really didn't know was there be lifted off your shoulders. 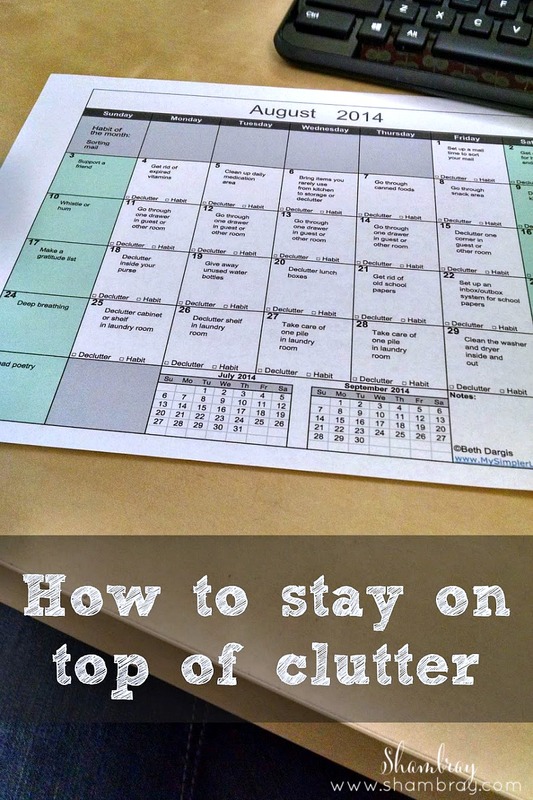 Clutter weighs us down and this calendar helps lighten the load. Let me know what you think. I love it! Do you have any other solutions for decluttering you home? Yeah. This calendar really helped me get the "forgotten" areas to declutter. I hope you enjoy it and it starts helping you! What a great idea! I signed up for the emails and hopefully I can keep up. Yay! I hope it helps you like it has helped me! Where is the link to the website? You refer to it but there is no link. I just made the links more noticeable. Sorry there was only one link and it was kind of buried in the post. I hope you like the calendar as much as I do.